FEBRUARY 8, 2019 — The 2017 natural resource damage settlement agreement for in-river injuries reached between NOAA, our co-trustees, and parties potentially responsible for hazardous waste releases into the Raritan River from the American Cyanamid Superfund Site in Bridgewater, New Jersey. 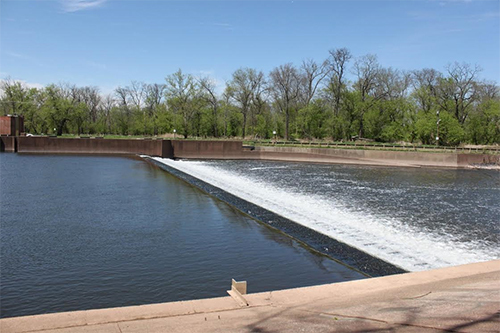 A design for enhancing fish passage at the Island Farm Weir, constructed in 1993 to impound water into surface water intakes, is one component of a 2017 natural resource damages settlement agreement achieved by NOAA and our co-trustees. Image credit: NOAA. The agreement included two components: (1) the removal of the Weston Mill Dam and (2) a design for improved fish passage on a second barrier, the Island Farm Weir. Removal of the Weston Mill Dam (video) was a big success and design for improved fish passage on the second barrier continues to make progress. This March, river velocity measurements will be obtained at so that a 30% design can be completed this summer. Improved fish passage at this barrier will help fish reach their upriver spawning habitats. The American Cyanamid Superfund Site is one of several contaminated sites along the Raritan River and its tributaries. Many of these sites are now being remediated and the watershed is being restored. For further information, contact Reyhan.Mehran@noaa.gov.